In Plain Sanskrit is the latest work by the intriguing and prolific duo that is Raina Peterson and Govind Pillai. Trained in the 3000 year old classical Indian dance forms of Mohiniattam and Bharata Natyam respectively, Peterson (Ladies of Colour Agency, Karma Dance Inc.) and Pillai (Founder Karma Dance Inc.; Samskriti Dance) are seasoned performers whom both regularly write, direct, choreograph and perform in classical and contemporary dance works to high acclaim both in Australia and overseas. This includes the Melaka Arts and Performance Festival (Malaysia), Parramasala (Sydney) and the Victorian College of the Arts. Commencing their creative partnership on their frequent festival performances, Peterson and Pillai bring contemporary ideas to the traditional art forms in which they are trained – no easy feat for dancers spawned from a lineage of strict rules, discipline and unquestionable order. Their pieces have formerly incorporated a range of influences from acro-yoga through to improvisational and site-specific techniques, but as this performance goes to show, there is no telling what is next from these two bold and captivating dancers. In Plain Sanskrit is their latest installation, developed with support from Maribyrnong City Council and the assistance of Footscray Community Arts Centre. The intention of the work is to pay homage to the essence of classical Indian dance, whilst pushing the boundaries to which the form is accustomed; boundaries possibly associated with attitudes that lack alignment to contemporary generations of classical Indian dancers. This intention is stunningly captured by the photography of Hayden Golder and the costume stylings of Vernon Curtis – two exceptional features in the production of this work. Commencing the occasion with flowers strewn upon the stage, the dancers enter with heads bowed holding brass pots. Their humility in service to the art is evident from the beginning. To the comforting whisperings of a sitar, the story begins. The audience is led gently and soothingly through the tales woven by these two beautifully adept dancers. The smooth, lilting and circular motions of Mohiniattam, a classical dance form from Kerala, are coupled with the swift geometric aesthetics of Bharata Natyam, a classical dance form from Tamil Nadu. However, as both styles are derived from the foundational postures noted in India’s ancient performing arts text – the Natya Shastras – a seam of underlying symmetry brings the pair together in motion. Peterson and Pillai juxtapose traditional classical pieces with interludes of abstract sequencing and dramatization. This includes pieces as derived from the Bhagavata Puranam scriptural text and as composed by Saint Tyagaraja – a stalwart of Carnatic music. Each dancer leads us through tales as spoken by the physical language of their form, the mudras (hand gestures) and abhinaya (expression) casting images and scenes of Hindu lore. A most beautiful depiction of Lord Krishna, played by the graceful and expressive Pillai, slaying the serpent Kaliya, which is embodied with exemplary physicality by Peterson, is performed to a wide eyed audience, captivated by the unfolding drama. From this space of safety in their classical form, we witness a gradual breakdown of the boundaries that have been established. Playing on the language of classical verbal percussion, known as nattuvangam, alongside mudra sequencing, Peterson and Pillai demonstrate the array of auxiliary skills that a young classical dancer develops in learning the dance-form. A poignant and touching part of the show sees Peterson and Pillai commune by a mound of rice flour which is gently crafted into a lotus mandala upon the stage. Rice flour is still used in the Hindu tradition today to draw mandalas or kolams at the place of worship. This homely act is performed with care and affection by the two dancers, inviting a warmth and intimacy into the space, allowing the audience to feel that we are witnessing more than a performance; that we are here upon the floor of their homes, sharing time in quiet worship. 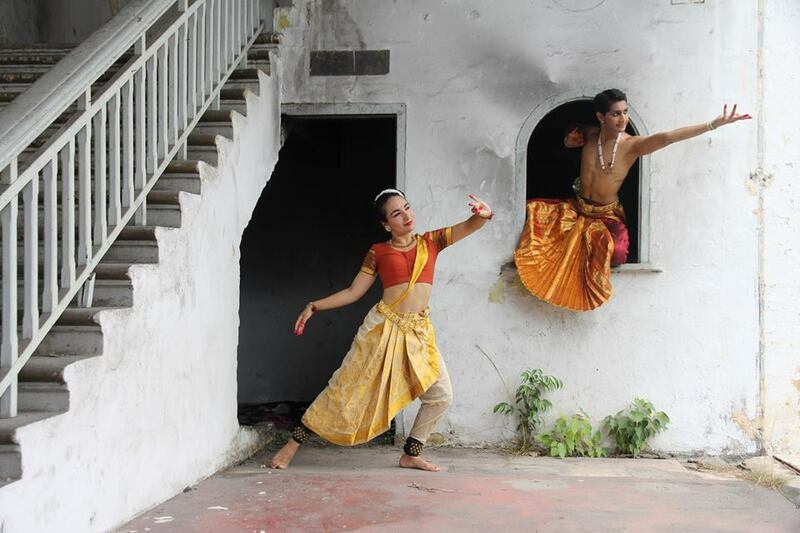 However this show is by no means about quiet worship alone; as the work travels through unexpected layers, Peterson and Pillai – two striking and joyful performers with grounded stage presence – unravel their forms before the mandala, engaging in what could be interpreted as a dance battle turned rice flour fight. Set to the emotive Taiko drum beats played by Kav P, this is a powerful moment. It is here in this seemingly humorous and playful act that several tensions of the classical convention are tested: the mandala is kicked with the feet, taught by the Hindu tradition to be taboo in worship; the dancers touch each other in passing as they adorn each other in flour, again a taboo form of contact in classical dance; one by one, form is removed completely, and the two dancers play happily in the mist of white flour, dancing and moving as they please, each in their own worlds. There is no doubt that this is a scene of liberation – a child-like explosion of wonder with which the phrase ‘why not?’ is put into play. Closing with a benediction to the sacred Ganga River sung by Peterson before a silver pot of water, these children of the diaspora bring the performance home; home to the truth that for thousands of young Indian dancers around the world, the stories of the classical arts are a bloodline of connection to a time and history we could never otherwise know. The scene is filled with the energy of pure homage, the song a yearning and loving ode to a place that transcends time and space. Peterson and Pillai are learned and talented performers that are simply beautiful to watch. Their respect for the dance forms in which they are trained is evident throughout the work, as is their curiosity to explore the spaces outside of it. This is a testament to the teachings of their gurus, the esteemed Smt. Tara Rajkumar and Smt. Hamsa Venkat. Each of these dancers holds a strong presence on stage, and ably demonstrates the subtle nuances and alignments of their form. Pillai especially also demonstrates impressive vocal range and talent, whilst both dancers show an understanding of percussive structure and technique. While the work is contemporary in its format, the dance-forms themselves are left largely untouched; rather, they present the original rasa – the emotional or aesthetic expression – in which they were conceived, alongside visual narratives associated with abstract contemporary arts. The result is a work spanning a wide spectrum of aesthetic, narrative and contextual possibility. Special mention must also be made to the Carnatic orchestra comprising young emerging musicians and artists from the Melbourne classical arts scene. Lead by the traditional percussion of the mridangam, as played flawlessly by Venkat Ramakrishnan, violinist Anita Das and vocalist Kasthuri Sahathevan weaved in and out of the improvised and structured formats of classical Carnatic songs with ease, tailoring them to the nuances of the dancer’s movement. Importantly, the verbal percussion, known as nattuvangam, which creates the connection between the movement sequences and the melodies, was expertly carried by Kersherka Sivakumaran. One thing that must be mentioned is that a Carnatic orchestra is uniquely complex by convention. Each element, governed only by the knowledge of an underlying rhythm loop, is expected to improvise along sequence structures and ragas or scales, whilst pre-empting the climax of the other elements in the orchestra. Execution of Carnatic music for performance especially is a most difficult feat and each member of the orchestra should be congratulated for their intellectual capacity and musical artistry. On a personal note, as a classical Indian dancer, I left this show equally as challenged as I was excited and inspired, and this is the true genius of In Plain Sanskrit. Ultimately, being trained in the rules and order of Bharata Natyam or Mohiniattam creates dancers that are subconsciously taught to pick fault with difference, and yet many young classical artists crave to create innovative and possibly controversial work, and liberate their training from its rigid boundaries. Young classical Indian dancers from all across Melbourne could be spotted in the audience for this show, and afterwards the foyer was abuzz with the energy of new possibilities that had been sparked in us. It is for this that we must take our hats off to Peterson and Pillai, two cultural pioneers at the beginning of a very interesting artistic journey.